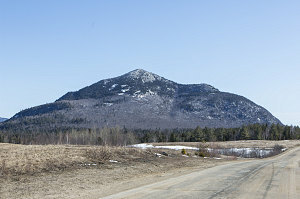 This climb of Catamount - a perennial short-peak favorite of mine - was part of a 2-day, 3-peak Easter weekend 2013 outing to the mountains of the Northeast. Catamount rose prominently out of a mostly flat landscape as we approached on Forestdale road from the west. 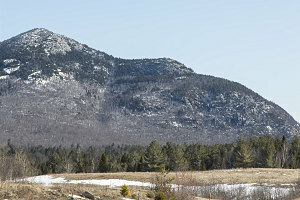 It was a cold day for this late in March; unseasonably so, but fortunately, calm and clear. 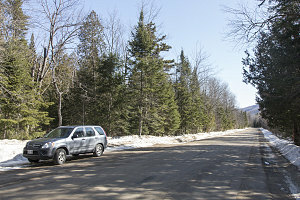 We quickly located the hard-to-find Catamount Mountain trailhead - but only by virtue of the fact that I'd done this peak many times before and knew to look for the two tree trunks blazed with red paint and the faint path leading off into the woods in between. 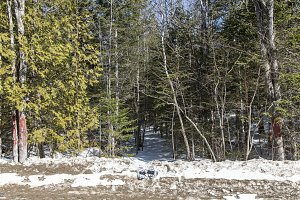 Although the trailhead is not officially marked, there is a NYSDEC official trail register a few feet in on the trail. There had been surprisingly little traffic on the climb recently - more than a week had passed since the last hikers had signed in. 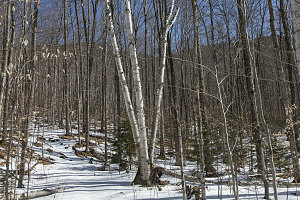 Here in the forest, there was still a continuous blanket of snow. We elected to start off in snowshoes, but soon realized that the snow was quite firm and hadn't necessitated them. We kept them on anyway out of laziness. 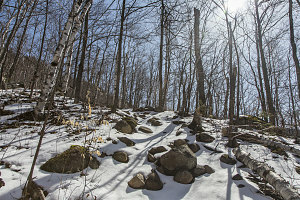 The first part of the trail crosses a flat stretch of land before reaching the southwestern base of the peak. This part went quickly, and soon we arrived at the pretty birch-and-maple forest that cloaks the southern base of Catamount. The open canopy and south-facing aspect had pretty much melted all of the snow base away, and we switched back to bare boots. 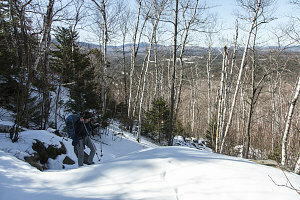 Now without snowshoes, we started the climb up Catamount. 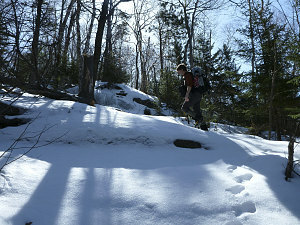 As we ascended, a thin layer of snow soon re-appeared, but it was quite firm and too thin to require a switch back to snowshoes. 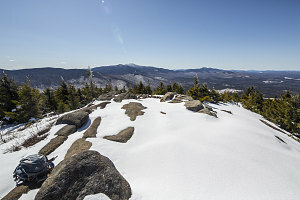 In fact, the snow was in the rare (for the Adirondacks) condition to allow boot-edging - a fine state of affairs where a hard, styrofoam-ish consistency allows short, crisp edges to be kicked into the snow - quite efficient for climbing. 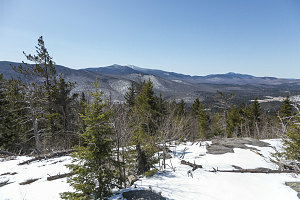 The Catamount mountain trail bends eastward as it climbs up the the southern slopes of Catamount. 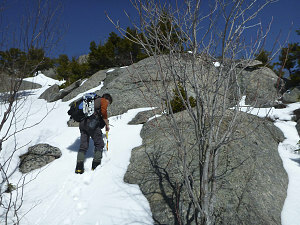 It first heads to the base of a bump that I like to call the "South Summit" - a fairly dramatic bare rock knob. 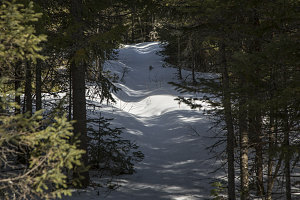 We encountered a few steeper bits along the trail that made us contemplate the usage of our microspikes, but for the most part the excellent firm snow provided positive tracking without any extra aids. 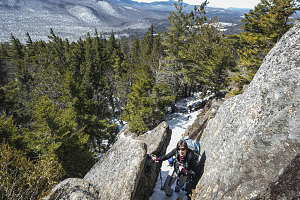 Soon we arrived at a small open spot below the now-impressive cliffs of the south summit knob. 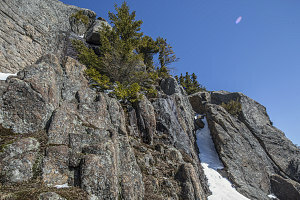 After a quick break, we continued on, soon coming to the "crux" of the climb up Catamount - a section of scrambling over crags and slabs that starts off with a narrow rock cleft that I call "The Chimney". 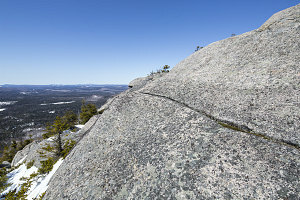 The Chimney is a section of eroded dike that has formed a steeply sloping cleft into the rock, providing a way up through the steepest part of the cliff band that protects the face of Catamount's south summit. Although a bit of scrambling skill is required, the enclosed nature of The Chimney provides a comforting lack of exposure. Still, some care was required, especially with snow and ice about. 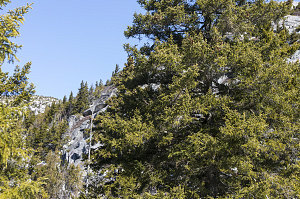 Once above the Chimney, we had to negotiate the steep slabs that remained between us and the south summit. 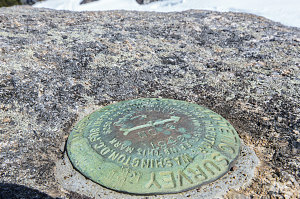 Many of the cairns that mark the route were buried in the still-deep patches of snow that covered the slopes, but manage we did, soon arriving at a chilly and breezy south summit, fully exposed to winds from the west. The south summit's cool weather conditions necessitated a re-layering break. 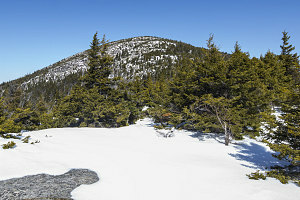 We could clearly see the slopes leading up to the main summit from here, and figured it would take not more than twenty or thirty minutes to get there. As it turns out, we were a bit slower than that: Soon after heading north from the south summit, crossing into the shallow col between it and the main summit, we encountered a lot more snowpack, and we started to posthole here and there. So, we needed to stop and get our snowshoes back on. Secondly, the trail through the col is fairly tricky to follow in winter conditions, and I had to do a bit of back-and-forth searching to find it. 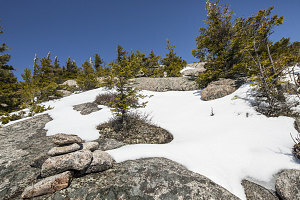 The col has an unsual set of steep bedrock fins that the trail winds up and over, and with the deep snowpack, it was not possible to see the little cairns that are placed here and there to guide hikers. 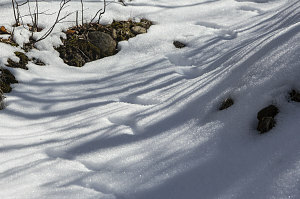 The orientation and nature of these snow-covered ridges created many false lanes and openings that looked like they might be the trail. 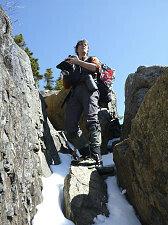 We perservered, however, and eventually nailed the right route and came to the start of the final slopes leading up to the summit. The trail climbs over a few minor scrambly steps, but mostly it is a pleasant series of open slabs dotted with bands of conifers. There was enough snow depth to allow more-or-less continuous snowshoeing up to the summit, although in a few places we had to contour around open bits of rock. We were again in the lee of of the mountain and fully in the sun, and it now felt quite balmy. 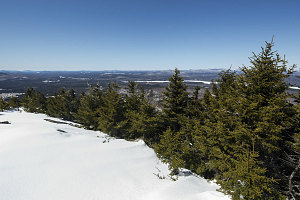 We arrived to the summit's excellent views and a surprisingly light wind shortly after noon. 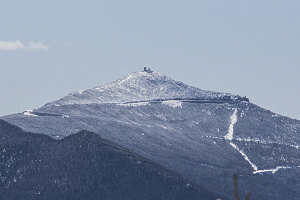 A short distance to the south, we could see the snowy top of Whiteface Mountain (and Esther in the lower foreground below it). 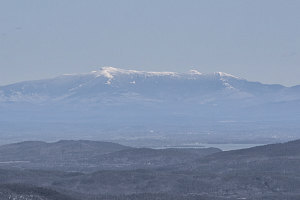 Way off to the east, a gleaming line of white marked the multi-summitted ridgeline of Mount Mansfield, Vermont's highest peak.